No matter the surface or the incline when climbing, it is important to have gear that keeps your hands focused on the mountain and not on fumbling with switches and buttons. Flashlights are a vital companion for any serious climber as they illuminate the terrain and help to make sure you are not caught off guard by loose rocks or roots. For this reason, we've reviewed our selection of products to find the best climbing flashlights for the avid adventurer. How did we narrow down our choices? We looked at power source, beam types, durability, and design. Long run times and multiple brightness modes are ideal for longer trips while higher lumen, lightweight lights are good for the recreational hiker on a quick trip. Regardless of skill level or outdoor ambition, you will want to be sure that you have the best climbing flashlights to keep safely scaling the mountain. Headlamps are the most often used flashlight for climbing purposes because they are hands free and can be easily directed by simply moving your head. However, angled flashlights can be a good alternative or even complementary light to bring with you. 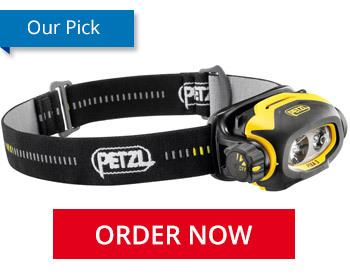 The Petzl PIXA 3 headlamp is our top choice when it comes to climbing headlamps. This LED light was designed for use in rugged terrains with its IP67 rating and two-meter impact resistance. The PIXA 3 LED headlamp also features a multi-beam design, such as flood and focus beams, that accommodates various needs, including close-up work and long-range search. This climbing headlamp runs on two AA batteries, which are ideal for those who may not have access to electricity to recharge internal battery packs. The safety-rated Petzl PIXA 3 is a solid choice for your next big climb. Would you prefer a hands-free right angle flashlight instead? No problem! We sell those too. In addition to the Petzl PIXA 3 headlamp, we've also listed some of our other favorites below. These products were chosen because they all offer an adjustable beam and extreme durability. These climbing flashlights also run on alkaline batteries for effortless powering. Impact Resistance is a very important feature when considering what type of light to bring with you on a climb. Everyone has the accidental drop or bad luck of a rock hitting your light, so it is a good idea to have a climbing flashlight that is tested to continue working in rough situations. The impact resistance is determined by dropping a light from the specified distance onto a concrete surface six times to ensure that the flashlight will function even with drops and falls. Considering flashlights are an essential part of night climbing it is important to have something that won't stop working at the first instance of impact. While Weather Resistance (IPX Rating) can be easily overlooked, it is important to take it into consideration when purchasing a climbing light. It is usually not a good idea to attempt climbing during rainy weather as it will make surfaces slippery and dangerous; however, should you find yourself in an unexpected deluge, it is essential that your light should continue to work. Many flashlights will tell you they are waterproof/resistant but for a more practical understanding of what those may mean you should turn to the flashlight's IPX rating. The IPX rating test involves putting a flashlight through water resistance testing after it has been tested for impact rating to make sure that even battered flashlights can withstand moisture. For this reason, we've only selected climbing flashlights rated IPX-6 or higher. Beam Type is an important feature to consider when shopping for the best climbing flashlight. Generally speaking, climbers will want to look for a hybrid of a flood beam and spot beam. Each type offers a trade-off, flood beams will illuminate a wider area while spot beams will illuminate a smaller area but to a greater degree. Spot beams are great for illuminating and inspecting possible routes for climb-planning purposes while the flood beam can be used for general canvassing of the climbing face or for a map reading break. Beam choice is a personal preference and should be picked with your specific climbing style in mind, but for a choice that covers most bases, it is suggested to go with an adjustable beam that can switch modes between flood and spot beam styles. Additionally, it is good to consider flashlights that having a head the allows for physical angle adjustments as this can save you from having to look at awkward angles to illuminate parts of the rock face when using a headlamp. Power Source should also be considered as it has a huge impact on your flashlight's runtime and longevity. Commonly used AAA and AA batteries are a favorite because of their wide availability and inexpensiveness, while disposable CR123As are also used for more high-performance lights. Disposable batteries may be initially inexpensive but if you are a frequent user of your flashlight, it is probable that you will rack up a substantial battery cost over time. In the case of frequent use, rechargeable batteries may be your best option as they are initially more expensive but will save you much more money in the long run and are more environmentally conscious by reducing used battery waste. In terms of chemistry, lithium batteries are the best choice for outdoor activities due to their long run times and durability in extreme temperature situations. While lithiums are more expensive than alkaline batteries they are certainly worth the peace of mind that your device will continue to work properly on a climb no matter the weather conditions. Interface involves the design of the light and just how easy to use it truly is. A well-constructed easy-to-use interface is essential for climbers as quickly being able to change modes and make adjustments means less time that your hands are off the climbing surface. Because interfaces are not standard across flashlights this buying features will be a matter of preference and will likely involve previous flashlight knowledge, or going into a physical store to get your hands on some lights to feel what is right for you. A general rule to follow is that all functions and mode switches should be possible with one hand. When looking into this you will want to have an idea for the type of climbing you are buying a light for. For example, with climbing that will require your hands at all times look for a light that has an all-purpose model that won't need changing, while more recreational climbers should look for a light with easy access buttons or a twisting bezel interface for quick and easy mode changes. Should I go with a two strap or three strap headlamp for added security? Do I want a battery pack that will add weight but increases potential run time? Do I want that battery pack to be attached to my head or waist? How will that affect my weight distribution while climbing? Should I purchase add-ons such as filters, belt clips, carabiners, or holsters to modify my flashlight?